My Fresh Ink – Why It Matters – remember. reclaim. 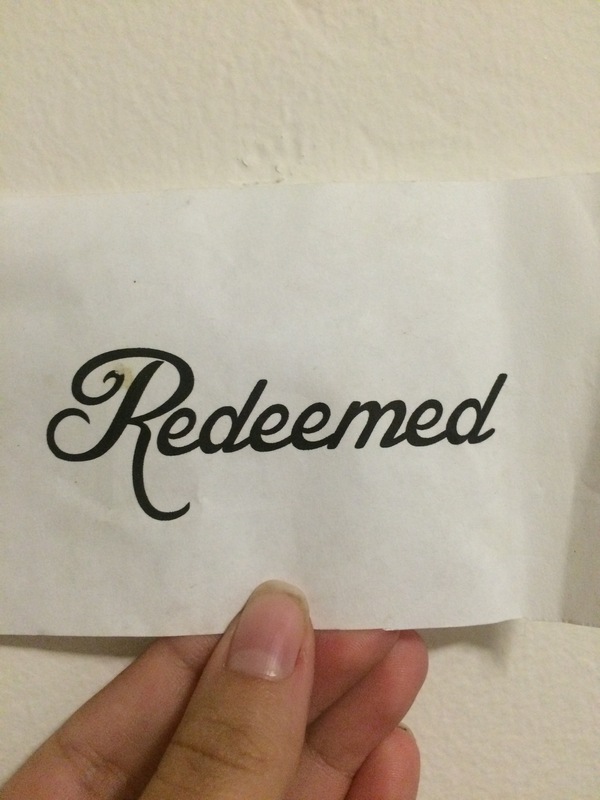 redeem. Afterwards, we went to one of their houses. I began to feel separated. The self-hating words came back so easily into my brain. Words I thought I had fought off over the years. You’re worthless, Jaymie. You’re ugly, and you’re gross, and no one loves you. No one will ever love you. Obviously, I had a room full of friends who disagreed. Yet it didn’t stop the thoughts. I locked myself in my friend’s bathroom and did what I had done a handful of times: pulled out a pen and wrote these words across my stomach. “Fat” is a common one, which is probably the one that hurts me now the most because I don’t see it as bad. Yet it was littered next to “worthless” “ugly” “gross” “stupid” “unlovable” and anything else mean I would think of. I looked in the mirror with my stomach covered in pen ink and repeated these things to myself. No one will ever love you. My friends found out and they were ticked. Maybe worried. Maybe concerned. They told me to wash it off. It was the last time I ever did that. The thoughts didn’t always go away, but I stopped writing these powerful words across myself. Later that year, one of my friends got a tattoo. I had never thought about that as an option. I was pretty against tattoos, and also I have a pretty sad pain tolerance. I hate pain. But as I watched his testimony, it interested me. I never wavered. I was just too afraid of the pain. I couldn’t get myself to look at shops or artists. I knew it would be easy for nearly anyone to write on my body; I was just scared. It’s 2015. I finally went in. I need to tell the story. The story didn’t end in the bathroom in 2011 with me crying and writing stuff across my stomach. I read an article about preparing for tattoo pain that hit me: you get hurt so often in life for far less of a purpose. Emotional and physical. Why not allow the pain in order to tell a story? The words I wrote caused a lot worse pain than the hour and a half I spent squeezing the heck out of Corey’s hand during this tattoo. (human stress balls. gotta love it.) It’s the final pain relating to ink on my stomach though. I was willing to endure a type of pain in order to tell my story, and declare what is right. Those words were temporary. 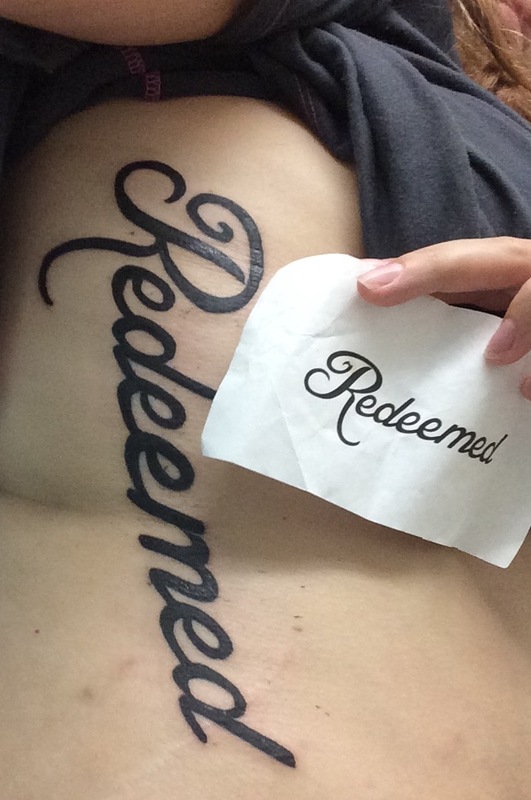 But this tattoo, like God’s redemption, like God’s spoken words about my identity, is forever. It is permanently written across both my skin and my soul that I am who God says I am, and not the lies I tell myself. Though I may believe those lies for a time, they are not the truth. The truth is what remains on me once the rest is washed away. I still don’t always love myself. But yesterday as I looked in the mirror, I could not stop smiling. I will never be able to look at my stomach in a negative way again. How can I? When I look, I see beautiful artwork about my redemption. The truth is in front of me. The lies will be that much harder to believe.